Currently Erica is a Junior studying Musical Theatre at the University of Cincinnati – College Conservatory of Music. Any time she hasn’t been in school, she’s been working professionally as an actress. After she graduates from college in two years she plans to move to New York, which is really excited about! 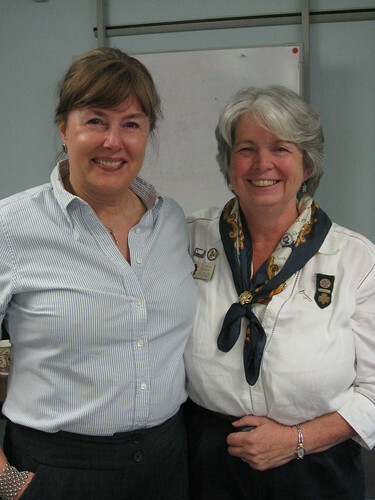 Today Girl Scouts of Colorado bestowed a high Girl Scout honor on one of our board members. Michelle Bellows from Fort Collins received the Thanks Badge II , one of Girl Scouts of the USA’s highest adult volunteer recognition honors which recognizes outstanding service made to the Girl Scout movement on a national basis. Michelle has served on the Girl Scouts of Colorado board since the formation of the council in 2007. Through her hard work, Girl Scouts of Colorado has a one-of-a-kind council governance system, known as the Membership Connection Committee, which work hand-in-hand with the board of directors on council policy decisions and ensuring our membership has a strong voice in the issues they care most about. Prior to her leadership with Girl Scouts of Colorado she held voluntary leadership positions with the legacy Mountain Prairie Girl Scout Council in Fort Collins. Michelle received a standing ovation from the Board of Directors when she received her pin at their annual meeting today at the Denver Service Center (a few tears were shed too). Michelle’s term is also ending on Girl Scouts of Colorado board today, but we know her service to Girl Scouts of Colorado is far from over! We truly thank Michelle for all she has done to help pave the way for building girl leadership through Girl Scouting in Colorado! Last Thursday evening, Sept. 13th, Girl Scouts of Colorado honored their 2012 Pikes Peak Women of Distinction and Women to Watch at the Thin Mint Dinner at Cheyenne Mountain Resort in Colorado Springs. A group of nearly 225 gathered at the event, which raised money for local Girl Scouting programs as well. This dinner event spotlighted Girl Scouts’ Live Healthy, Lead Healthy initiative, focusing on self-esteem, good nutrition and exercise that will help prevent health issues and other serious ailments that affect girls and women. Premiering at the event was a video on healthy living created by Colorado Springs Girl Scout Troop 3810. View the video here. Nancy Saltzman, who recently published Radical Survivor: One Woman’s Path Through Life, Love, and Uncharted Tragedy, was the keynote speaker, and Craig Eliot from KOAA-TV and Katie Carroll from the Better Business Bureau of Southern Colorado were the emcees. U.S. Olympic bobsledding athlete Emily Azevedo, who placed 5th in the 2010 Olympics, signed autographs and posed for photos with guests as well as spoke about healthy living and the impact Girl Scouts had on her life. The event was a three-course dinner featuring the creative use of Girl Scout Cookies. Event chair was Mary Lou Makepeace, the 2002 Girl Scouts of Colorado Mary Jean Larson Community Service Award recipient. 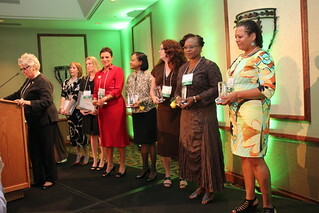 Girl Scouts of Colorado honors top women leaders in our community as Girl Scout Women of Distinction or Women to Watch. These women have reached remarkable levels of achievement as business, philanthropic, government, education and community leaders. They are committed to making the world a better place for the girls of today and tomorrow. They donate their time, talents and experience to Girl Scouting and also support Girl Scouts financially. Since 2000, 43 women have been named as Pikes Peak Women of Distinction and raised more than $300,000 for Girl Scouts of Colorado. Special thanks goes to the following sponsors of this event: FirstBank, Cricket Communications, The Gazette, Ent Federal Credit Union, Mido Printing, Delta Dental of Colorado, El Pomar Foundation and BKD LLP. For more information on the Girl Scouts of Colorado Women of Distinction program, visit our website at girlscoutsofcolorado.org/donors/women-of-distinction. The Colorado Springs Gazette also did a nice post event article with photos in their Sunday, Sept. 30th, edition. There was also an article in the Oct. 12th Cheyenne/Woodman Editions. Girl Scouts of Colorado was proud to be one of four recipients honored at the Second Annual Ally Awards to honor allies to the LGBT community. The signature event of One Colorado Education Fund, The Ally Awards celebrate allies because of their tremendous ability to change the hearts and minds of Coloradans and because of their courage. Girl Scouts of Colorado was honored for being an inclusive organization and welcoming all girls. Girl Scouts was in good company with our fellow recipients Faye W. Tate, Dr. Christopher Urbina, and Compañeros: Four Corners Immigrant Resource Center. You may or may not remember the story, but back in 2004, a group of Girl Scout Juniors from Lakewood, who were working to earn their Girl Scout Bronze Award, helped designate Yule Marble as Colorado’s State Rock. One of the most powerful lessons the girls learned is that you can make a difference, no matter your age. Now Girl Scout alumnae, these young women recently looked back on their journey in a video produced by the Colorado Channel of Open Media Foundation. How are Girl Scouts in your community making a difference? Colorado Springs Troop 3810 volunteered to work at the Region 4 Fall Product Sales Rally. They did everything from babysitting, playing games and teaching. They even got to learn an awesome new GS song and dance.Here are a couple of fun pics! Thanks to SU13 for having us! Girl Scouts of Colorado and FIRST Lego League! Announcing GSCO Participation in the FIRST Lego League Robotics Challenge! Girl Scouts of Colorado is excited to announce that we have been awarded funding to support two teams in the *FIRST Lego League Robotics Challenge! This year’s challenge? Come up with an innovative “Senior Solution” to a problem facing the elderly and aging in your community. Learn how to use technology to take action! ONLY 20 girls will be chosen to participate in this highly respected international program. Participants will attend a mandatory kick-off event in Denver the evening of October 3rd. Teams and coaches will agree to meet at least once per week in October and early November to get ready for competition in late November. (Meeting location determined by mentor coach, teammates and parents). Each team will share their innovative “Senior Solution” with the GSCO community in the spring of 2013. VOLUNTEER OPPORTUNITIES! The Girl Scouts of Colorado is also looking for coaches and assistant coaches to help with the First Lego League Robotics Program! Are you passionate about making a difference in the lives of girls? Do you want to help girls develop technology-based solutions to issues facing seniors in your community? Becoming a FLL coach is the ideal volunteer opportunity for someone really looking to roll up their sleeves and work directly with girls in a meaningful way! Volunteers will be asked to give approximately eight hours a week to this program. YES – parents of participants can be coaches or assistant coaches! We will be hosting an introductory volunteer meeting at 5:30 PM on Tuesday 9/25. If you want more information or to get involved, please email beth.ryan@gscolorado.org. Develop employment and life skills including critical thinking, time management, collaboration, and communication while becoming more self-confident. In her mom’s eyes, Reanna is a hero. For Reanna, she was just doing what needed to be done. Earlier this spring, Michelle McKeehan, Reanna’s mother, awakened her daughter in the middle of the night because she wasn’t feeling well. Shortly after, Michelle collapsed. Being the only one at home, Reanna was quick to call 911 and communicate her mother’s condition, including checking for her pulse, monitoring breathing and checking for other injuries. When paramedics arrived, she was able to answer questions and give them her mother’s medications. “Later when I saw my mom in the hospital, her first words to me were, ‘You’re my hero’,” said Reanna Lawhorn, 10, from Montrose. Reanna credits the Girl Scouts for helping her learn how to handle emergency situations. “I had earned Girl Scout badges where we practiced what to say when you call 911, how to answer questions as well as how to check someone’s pulse and see if they were breathing,” said Reanna. 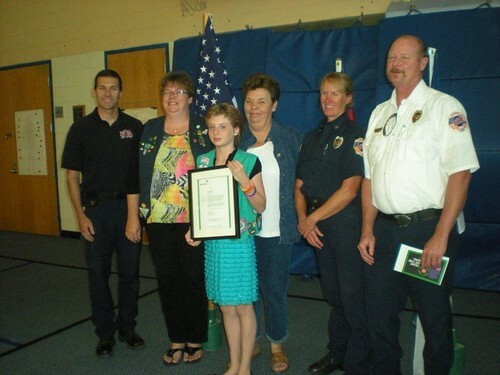 On Friday, Sept. 7, Girl Scouts, with the help of Montrose Mayor Thomas Smits and representatives of the Montrose Fire Department, recognized Reanna’s heroic acts in saving her mom’s life by presenting her with the national Girl Scout Medal of Honor Lifesaving Award. This award has been presented only two other times in Colorado since 2009. “It feels awesome that Girl Scouts has honored me,” said Reanna, who enjoys traveling and doing crafts and community service with Girl Scouts. Reanna’s award has also been the “talk of the town in Montrose.” “My friends keeping asking me all about it,” commented Reanna. “Reanna is a great role model and leader for our community, showing people you can step up to help someone else, no matter your age,” said Reanna’s mother, Michelle, who is also proud of the work her daughter has done in Girl Scouts with the town’s child advocacy center. The Lifesaving Awards have been part of the Girl Scout program since the beginning of the movement in the United States. The Medal of Honor award recognizes Girl Scouts who have saved or attempted to save a human life under circumstances that demonstrate heroism without risk to their own lives. It is reserved for those Girl Scouts who have performed heroic acts beyond the degree of maturity and training to be expected at their age. For more information on the Lifesaving Award, contact your Membership Manager. This award presentation generated media coverage in the Montrose Daily Press as well as on KJCT-TV (ABC). Each year a United States National Forest is chosen to provide the National Capitol Christmas Tree for Washington, D.C. This year the White River National Forest, Blanco Ranger District, located in Meeker, Colo., was chosen as the site. Read more about the tree at capitolchristmastree2012.com. Along with the Capitol Christmas Tree, approximately 70 Companion Christmas Trees are shipped to Washington, D.C. dignitaries, the Interior Department and Congressional Delegates. Girl Scouts of Colorado has been asked to help make the Christmas Tree Skirts that will be accompanying these trees. We will provide you with all of the supplies and templates, and then you can get creative with how to construct the skirts. Depending on interest, Girl Scout groups might be asked to create more than one skirt. If your Girl Scout group is interested, please call or email Kristin Courington at 720-288-1615 or kristin.courington@gscolorado.org by Sept. 21. The skirts will need to be completed and returned to Girl Scouts of Colorado by Oct. 9. A flyer on this project can be downloaded here: Capitol Christmas Tree Skirt Project. The Fort Collins Coloradoan newspaper’s Sarah Jane Kyle also attended the event, and will be publishing a story on Friday, Sept. 14th, about the flexible ways to volunteer for Girl Scouts. Be sure to check it out on their website here. The Lighten Up event will travel around the state over the next year. Learn how you can participate by visiting our website. STEM is an area of focus for Girl Scouts, helping girls discover that they can grow up to be leaders in this field. 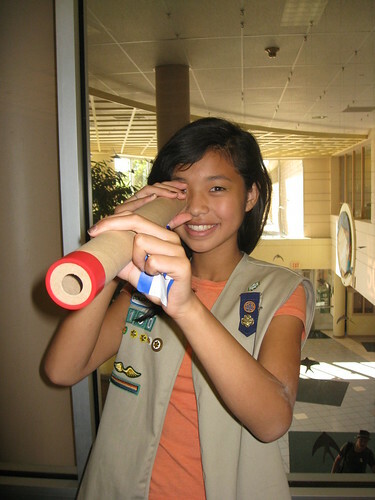 Learn more about Girl Scout STEM research.